From left are Dee Fowler, Trish Gilbert, Wayne Nelson and Marie Nelson. 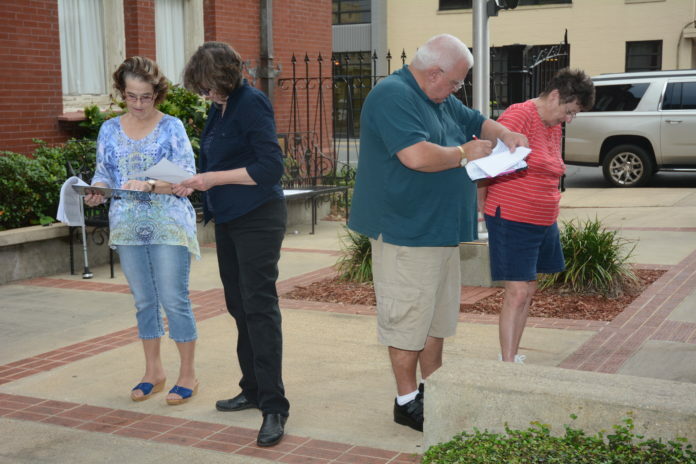 Members of the American Legion Auxiliary, Unit 10 recently met at the Veterans Park in downtown Natchitoches. Working over a two-day period, their mission was to catalog the bricks placed there to honor parish veterans. They were organized by section and number in preparation for the Veteran’s Day program to be at the park Saturday, Nov. 11 at 3 p.m. The resulting list will be put in a kiosk in the Park to guide visitors who want to look for bricks of their loved ones or friends. Those present were Leta Brown, Jan Darfus, Dee Fowler, Trish Gilbert, Jo Lapeyrouse, Donna Masson, Marie Nelson and Wanda St. Andre. Also helping was Wayne Nelson of the American Legion.